A free, public lecture by Stan Nelson on the history of early typesetting. Registration is requested. The invention of printing with movable types took place in the mid-fifteenth century, and from the very beginning the challenge was not just producing multiples of texts, but to do so in an attractive and convincing manner. How did the early printers accomplish this so successfully, and in what ways did the process evolve? 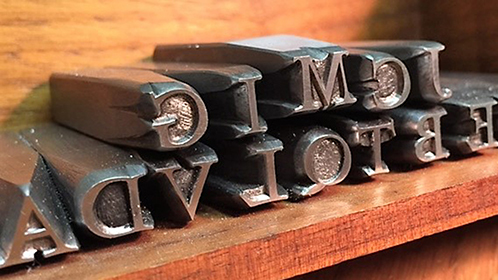 Letterpress remained a dominant printing process through much of the 1970s and is undergoing a renaissance today. In what ways did "modern" technology affect the manufacture of metal printing type, and will such types continue to be developed and produced? Raymond "Stan" Nelson is a practicing punchcutter, typefounder, and letterpress printer who had the great good fortune to work in the Graphic Arts Collection at the Smithsonian's National Museum of American History from 1972 to 2003, and continues to serve there as a Museum Specialist Emeritus. Stan's extensive knowledge of printing and typefounding history, as well as over forty years of practical experience with the oldest technologies for making printing types, gives him a unique perspective when examining the tools and methods connected with the production of metal letter. Stan can be seen making type in videos available on YouTube, as well as in the BBC production The Machine that Made Us, hosted by Stephen Fry.